The 35-year-old suffered the injury while in action for Ipswich Town last Saturday. IRELAND STRIKER JON Walters has been hit with a major setback after it has been announced that he suffered an Achilles injury that requires a six month spell on the sidelines. 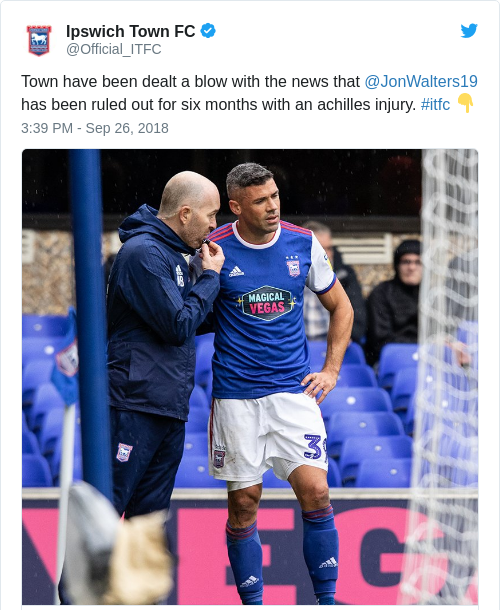 Walters suffered the injury in action for Ipswich Town last Saturday during their scoreless draw with Bolton Wanderers in the Championship. He was withdrawn moments after coming on as a second-half substitute. The club confirmed this afternoon the extent of the injury Walters has incurred. He has a partial rupture of the Achilles and while surgery is not necessary, he is set to be out of action for six months. The news means Walters, who joined Ipswich on loan at the end of August for what was his second spell with the Portman Road club, will now return to Burnley to recover from his injury. “I’m obviously gutted with the news,” Walters told the Ipswich Town club website. “That’s football though. That’s life I suppose as well and while I’m really disappointed, there are a lot of people worse off than me. It’s another blow for Ireland manager Martin O’Neill with the loss of one of his most experienced players through injury. Walters started in the 4-1 loss to Wales in the recent Nations League opener and will now miss the games at home to Denmark and Wales next month, along with the trip to Aarhus to face the Danes in November. The 35-year-old has 54 caps for Ireland and has netted 14 times, including a five-goal haul in the Euro 2016 qualifiers that included a brace in the play-off win over Bosnia. Email “'I'm obviously gutted: 6-month layoff for Ireland's Walters after he suffers Achilles injury”. Feedback on “'I'm obviously gutted: 6-month layoff for Ireland's Walters after he suffers Achilles injury”.